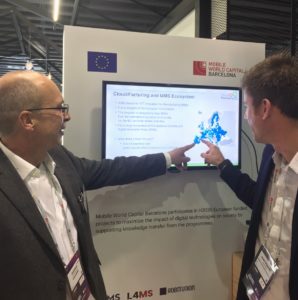 Last week, the Tech4 Corporate 2019 Event took place at the MWC 2019 (Mobile World Congress 2019) and CloudiFacturing’s CEO, Andreas Ocklenburg, was invited to share his experience with the I4MS initiative on this year’s edition. This year’s edition of MWC granted visibility with a permanent space at the center of the MWCapital Barcelona Stand where the I4MS highlights will be featured. Andreas Ocklenburg and Juan Manuel Jauregui at the MWC 2019. 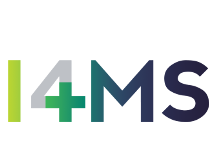 This space allowed to create differently industry-driven activities in order to promote the I4MS initiative and to spread the word about the opportunities and possibilities they have to offer. The “Thec4Corporates Sessions” combined different tool like in-person workshops, elevator pitches, and seminars in order to take advantage of the strengths of personal communication to reach the target audience and communicate the benefits of becoming a part of the I4MS environment. They made our visit a successful one! We hope we can work together again!